$160.00 Badge of Excellent Health Care Professional, Type 1 Var. 2, #1379, circa 1942-43. The relatively early WW2 version, very complex in construction and of beautiful quality. In fine condition: shows minimal enamel damage only. Scarce original screw plate is included. $80.00 Excellence in Medical Corps badge, NKPS version, mid-1940s. In outstanding condition. Includes original maker marked screw plate of WW2 era. $15.00 XXIII Trade Union Conference of the Riga Medical Institute, 1973, participant's badge. $15.00 XXV Trade Union Conference of the Riga Medical Institute, 1975, participant's badge. $295.00 Trade Union of Medical Help Providers (MEDSTANTRUD) of the USSR, membership badge, early to mid-1930s. In excellent condition, very uncommon for this badge. Includes original screw plate. $10.00 USSR Red Cross Membership badge, circa 1970s-80s. $25.00 Red Cross Membership ID, issued to a woman in September 1944. $28.00 Be Ready for Medical Defense of the USSR, 1930s-40s. Screw back version. $45.00 Ready for Medical Defense of the USSR, qualification badge, screw back version, 1930s - 1940s. In excellent condition and includes original maker marked screw plate. A very interesting and attractive piece. $40.00 Ready for Medical Defense of the USSR, qualification badge, 1930s - 1940s. Maker marked pin back version in excellent condition. $35.00 Ready for Medical Defense of the USSR, qualification badge, 1930s - 1940s. Pin back version, unmarked. In excellent condition. $18.00 Be Ready for Medical Defense of the USSR, pin back variation, 1930s-40s. $25.00 Be Ready for Medical Defense of the USSR, pin back variation with maker mark, 1930s-40s. 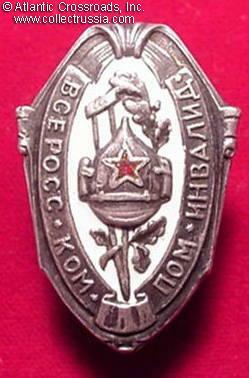 $110.00 Badge "Ready for Medical Defense of the USSR", 2nd Level, 1934 - 1941. Desirable screw back version in excellent condition. $35.00 Medal of Honored Blood Donor of the USSR, circa 1950s. Brass, enamels, very high quality. In excellent condition and includes original screw plate. $30.00 Document for a Badge (Medal) of Honored Blood Donor of the USSR, 1961 issue. Nice quality hard-bound booklet in excellent condition. $5.00 Blood Donor, 1st cl., circa 1980s. $10.00 Blood Donor, 1st class, 1960s - 70s. $8.00 Blood Donor, 2nd cl., 1960s-70s. In aluminum and paint; silver-colored medal, shows red cross and crescent emblem. $4.00 Blood Donor, 2nd cl., circa 1980s, Roman numeral "II" and red cross and crescent emblem. $5.00 Blood Donor, 3rd cl., 1960s-70s. $3.00 Blood Donor, 3rd class, circa 1980s. Aluminum and paint, round bronze-colored badge with red cross emblem. $14.00 Blood Donor of the USSR badge, circa 1950s. Brass, enamels. In excellent condition. $19.00 Blood Donor of the USSR badge, circa 1950s. Maker marked variation in brass and enamels. $8.00 Soviet Red Cross lapel pin, circa 1980s. $30.00 Badge Commemorating the 40th Anniversary of the Soviet Red Cross, 1958. $20.00 Nursing School graduate badge, 1970s-80s. Aluminum, enamels, mint marked.